Attributed to a factory mistake, the folding carton came on the scene in 1879 courtesy of the Robert Gair Company of Brooklyn, New York. 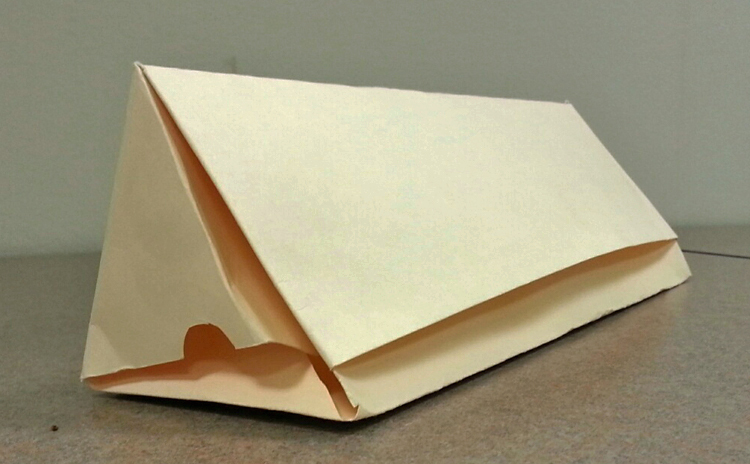 Read more about the history of the folded carton, an item we encounter almost everyday. I like boxes. They’re useful for containing, organizing, and moving “stuff.” Sometimes they hide the “stuff” you don’t want seen. Boxes can also be tempting. Who can resist not opening a box to discover its contents? As an archivist, I am fortunate to be surrounded by boxes of various sizes, shapes, color, and purpose. I use boxes every day to sort collections while processing (I’m partial to the record carton box), to store collections for long term preservation, and sometimes I build custom boxes. I recently found a “box in a box” in an unlikely collection, the Lehigh Coal and Navigation Company Records. 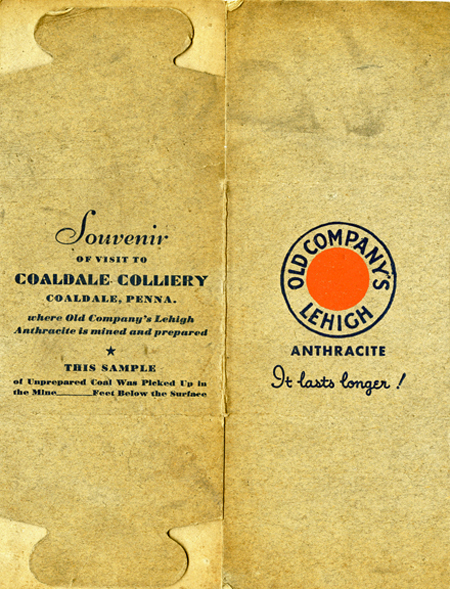 Documenting the anthracite mining industry in Pennsylvania, the records are primarily financial so finding a folded, paper box for “souvenir coal” was an unexpected and pleasant surprise. I knew that other paper packaging and folded cartons existed among our collections, especially in the advertising and consumer culture materials, but certainly not in the mining collections. 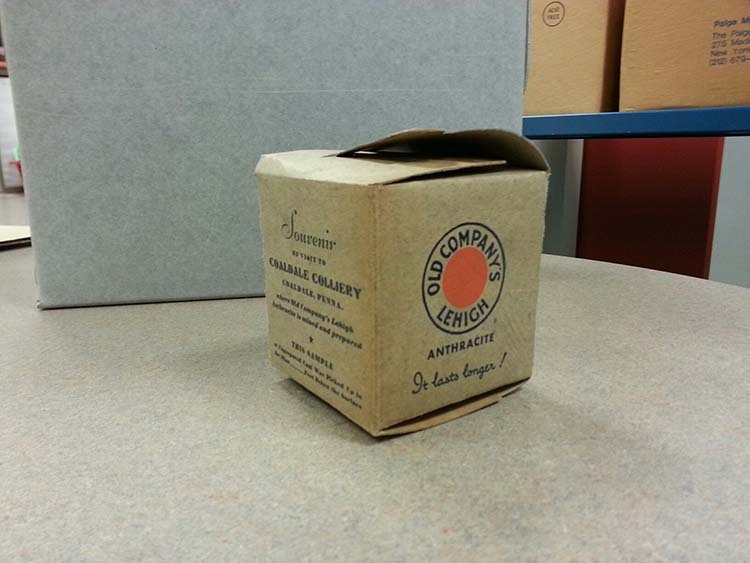 One of the most obvious places to look for information about boxes is the Warshaw Collection of Business Americana, (Series: Boxes and Paper Products). Souvenir coal box, undated. Lehigh Coal and Navigation Company Records. Photograph courtesy Alison Oswald. Some of the earliest boxes in America were band boxes (used for hats and gentlemen’s collars) and set-up or rigid boxes. The latter were strong and typically rectangular, cylindrical, or oval shaped with a lift-off or hinged lid. The set-up box first appeared in Europe during the 1700s and was then imported to America. Aaron L. Dennison (1812-1895), a Boston watchmaker and jeweler, and his brother Eliphalet Whorf (E.W.) Dennison (1819-1886) were early contributors to the manufacturing of set-up boxes in America for jewelry items. The Dennison’s sought to mechanize the process of set-up boxes and, “worked out the first paper-box machine, which was promptly set to work.” (Minson, page 25). Their company, Dennison Manufacturing Company, founded in 1844, expanded under the leadership of E.W. 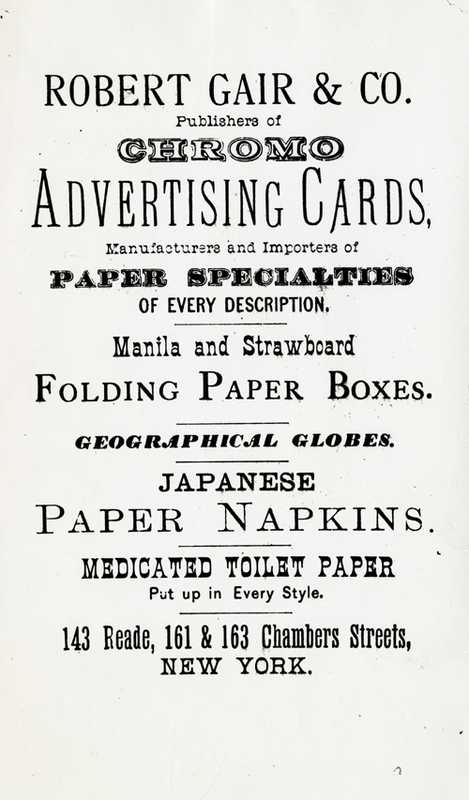 Dennison to include other paper goods such as merchandise tags, crepe paper, and wrapping paper. By 1860 more box-making plants were emerging in America and those manufacturers developed specialized equipment to speed production and reduce costs. Mechanization only increased the demand for boxes and the folding carton, a more efficient type of box for packing and shipping goods emerged on the market. Attributed to a factory mistake, the folding carton came on the scene in 1879, courtesy of the Robert Gair Company of Brooklyn, New York. Founded by Robert Gair (1839-1927), an inventor, printer, and paper manufacturer, Gair’s folding box, “would be the ‘fit survivor’ to the set-up box” (Bonner, page 595) and was enthusiastically received by the paper industry and consumer. According to an issue of Gair Today, in 1879, a machinist working for Gair, “allowed a rule on his printing press to stand up a little too high. It cut neat, but ruinous slits through several thousand paper seed bags before the mistake was discovered. Gair deliberately and experimentally raised the whole pattern of metal strips too high and saw his press cut out the perfect pattern of a folding box.” There is no evidence that the process was patented in 1879, but this observation by Gair and his implementation of the process helped the packaging and merchandising industries by ushering in a box cut from a single piece of paper. Using less paper, the folding carton was shipped in its folded state, saving on shipping and storage costs. Items formerly packed in tin or wood could now be packed in paper that offered similar strength and protection. While examining the Warshaw Collection of Business Americana (Series: Boxes), I discovered a prototype of a folding box from 1879, patented (US 218,479) by Italian inventor, Charles E. Bolchini of Milan. Bolchini’s box, like Gair’s, was cut from a single piece of paper, but Bolchini’s improvement in paper boxes was for a three-sided prism-shaped container. He assigned his patent to Alphonse Stephani of New York and William G. Moehring of Philadelphia, both importers of foreign items such as olive oil, wines, beers, oils, and soaps. According to New York City Co-Partnership Directory, in March 1879, Stephani and Moehring were business partners and presumably they obtained Bolchini’s patent with the intention of manufacturing it. The interesting shape would have been ideal for candies. Paper box of Charles E. Bolchini, 1879. Warshaw Collection of Business Americana, Series: Boxes. Photograph courtesy Alison Oswald. After seeing the prototype, I felt compelled to make Bolchini’s prism-shaped box. Following his pattern of folds, and with some minor adjustments, I succeeded. 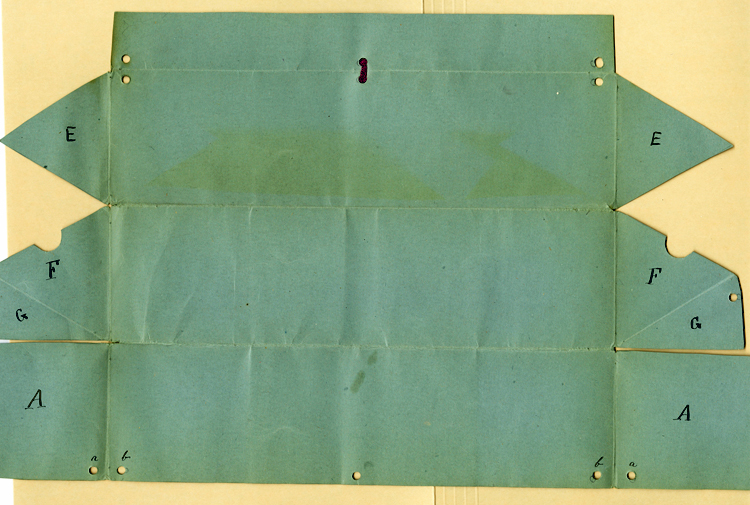 To learn more about boxes, paper manufacturing, and even coal, visit the Archives Center. We’ll gladly share our boxed up collections. Author’s prism-shaped box. Photograph courtesy Alison Oswald. Bonner, William Thompson. New York: The world's metropolis, 1623-4-1923-4: a presentation of the greater city at the beginning of its second quarter century of amalgamated government and the 300th anniversary of its founding, with review of the interim accomplishments of its citizens. New York: R.L. Polk, 1924. The Fatherland, vol. II, no. 1, February 10, 1915. Johnson, Roy. W. “Dennison’s Giant Business Built on Unconsidered trifles,” Printer’s Ink Monthly, vol. IV, December 1921, page 28. Minson, W.S. E.W. Dennison, A Memorial. Boston: Merrymount Press, 1909. Twede, Diana, Susan E.M. Selke, Donatien-Pascal Kamdem, and David Shires. Cartons, Crates and Corrugated Board, Handbook of Paper and Wood Packaging Technology, Second Edition. Lancaster, Pennsylvania: DEStech Publications, Inc., 2015. Robert Gair Company, Inc. Gair Today, A Big Company in a Very Large Industry, 1953. Smithsonian Institution Trade Literature Collection. The Trow (formerly Wilson’s) New York City Co-Partnership Directory, vol. 27, March 1879. Ajeeb, a ten-foot high, wax and papier-mâché mechanical wonder, won almost every game of chess and checkers it played. The story of psychologist and inventor Elmer Gates, who was known at the turn of the 20th century for his original ideas about experimental psychology and educating children.